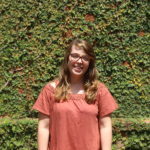 As part of our placement with Challenges Worldwide, each volunteer is a member of a committee, with a choice between communications, team building and impact. Our day-to-day purpose during the placement is supporting the growth and development of local businesses. Challenges recognises an opportunity to provide time to give back to other areas within the community, which is where our impact committees come into play. Split into two; Health and Education. As a member of the comms committee, I was given the privilege to attend the Health Impact Day, which was an insightful and accomplished event. I hope to share that experience with you as best I can. After weeks of planning and preparation, the time had finally arrived for the Health Impact Day. There was a buzz of anticipation amongst the group as we gathered in the early hours in Ntinda. We picked up two representatives from Days for Girls, the charity we are supporting, to help us run the health sessions. Days for Girls are dedicated to creating a more free, dignified and educated world, through providing lasting access to feminine hygiene solutions and health education. 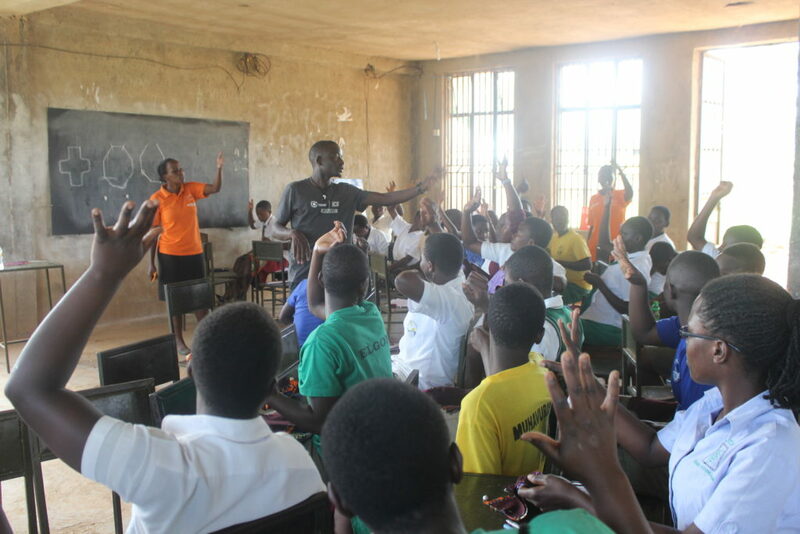 Being a taboo subject within Uganda, this charity wants to educate girls and boys alike about hygiene and menstrual health. A short while later we had arrived at Central View school and set up a room to prepare for the sessions. The day was split into two parts. The first part was with both boys and girls with ages ranging from 13 to 16 and the second half with just the girls. After an introduction about Challenges from Keebs and Annabell, session number one was on the importance of hygiene and staying healthy. Araphat and Alex led the demonstrations on hand washing followed by discussions on when to wash and why! We spoke about how to avoid illnesses such as malaria, by sleeping under a net and keeping the grass cut short, as this is where they breed. 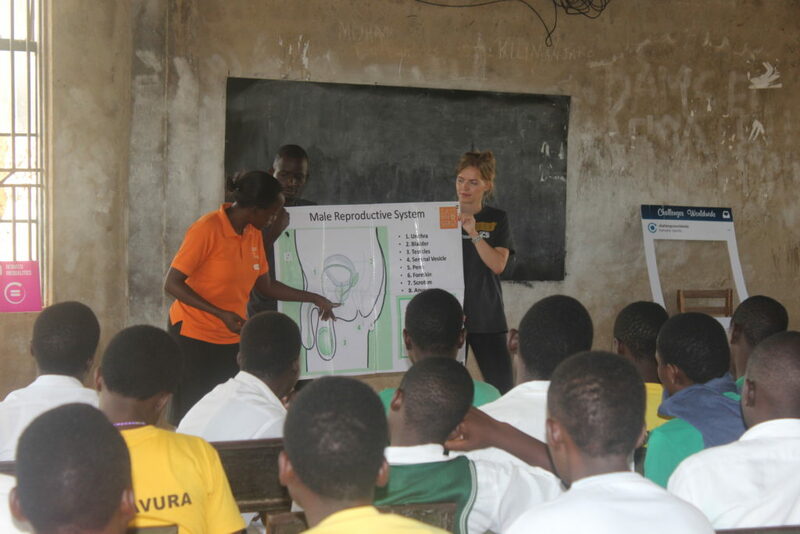 The next session was looking at male and female reproductive systems. Led by volunteer Rita, we explained the different areas and looked at the changes the body will go through during puberty. The third session for the morning was on menstrual health. It was important that the boys learn about the process girls go through in order to minimise the stigma surrounding the topic. It’s essential for them to be taught that it’s a normal process the body goes through and nothing to be ashamed of, especially not something to miss school for. We had a break at this point, which is when the boys were free to go. The afternoon was all for the girls. Kate started the session by demonstrating how the reusable sanitary pad worked, how and when to change it. Explaining the process of when to wash them and how to look after them. The pads are set to last for three years, but by teaching the girls to make them, they will be able to create more in the future. 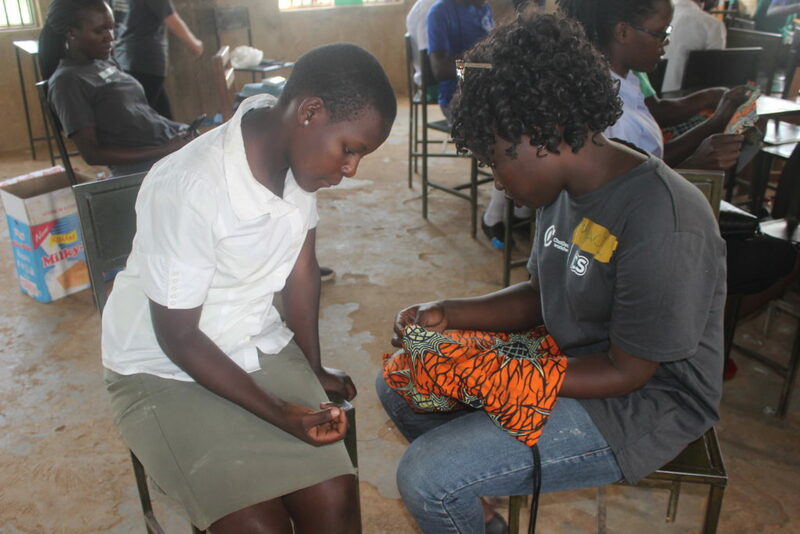 Days for Girls started by showing the girls how to make the bags that they can keep the pads in. This helps to develop their sewing skills as well! They made drawstring bags of fantastic kitenge print. They explained that if the girls had these with them everyday, they would always be prepared and no one would think it had anything to do with their period. Once the girls had made the bags, with some assistance from the volunteers, we stopped for lunch. At school, children are taught to eat with their hands. So, after teaching the importance of hand washing at the begining of the Health Impact Day, we ensured we had a make shift sink where the children could properly wash their hands before lunch, with assistance from Kate and Tanya. Us volunteers also ate with our hands, which is much harder than it looks! We continued the afternoon with sewing the sanitary pads. The concentration from every girl in the room was amazing! The aim is to get the girls to replicate what they have learnt. Not everyone has the chance to take part in a day like this, so it’s important that the message is passed across. 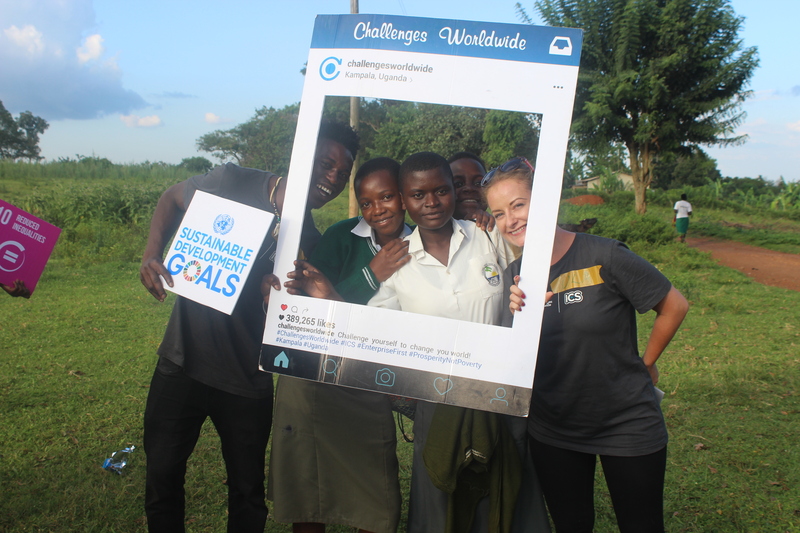 Challenges Worldwide is an advocate for working towards the SDGs. In the last session, volunteer Peace explained what these were and which ones we had covered during the Health Impact Day, included clean water and sanitation, and health and well-being. Days for Girls provide packs for the girls, which include a pair of pink pants and 7 more reusable pads. The volunteers gave these out to each girl, to put into their new bags! We asked a volunteer from the girls to explain and show everyone how they work and key things to remember. There was a very positive atmosphere throughout the day and the girls were very pleased with their new bags. As the day drew to an end, we had some photo opportunities with the girls, before they left. It was a very successful day and everyone left with knowledge and a smile.  Amazing work from the impact team! If you would also like to travel where the challenges are, as Evie did, click here for more information and apply to our programme by the 7th of January.